The final meeting of the 2012 – 2013 alPHa Board was held in the Atrium. Minutes of this meeting will be circulated among Board members under separate cover, as well as made available in the Board "Group” area of alPHaWeb. Delegates to the alPHa 2013 Annual Conference were invited to attend an opening reception at The View, where they had an opportunity to enjoy spectacular views of the downtown Toronto waterfront while munching on shrimp canapés and skewers of some kind of meat. The alPHa Conference kicked off with the Annual Business Meeting, where members received annual reports from alPHa’s President, Executive Director, Treasurer, Section Chairs and Affiliates; as well as reports on actions on last year’s Resolutions. Each of these was distributed prior to the meeting and can be read in their entirety in the linked Agenda Package. alPHa’s Annual Report was also distributed and is likewise attached. alPHa Vice President Mary Johnson then provided an update on the early stages of alPHa’s Strategic Plan. "As alPHa’s Vice-President, I am very pleased to provide the Association membership with an update on the Board’s strategic planning this year. Since December, alPHa’s Board has been engaged in strategic discussions about alPHa’s future directions. Since the outbreak of SARS in 2003, it has been recognized that the public health sector in Ontario needed to be strengthened. Funding sources have shifted and important new resources like Public Health Ontario have been put in place. There’s been a stronger focus on health promotion, with a new ministry created and then collapsed to a division within the ministry of health and long-term care. There’s been recognition of the role public health plays in reducing health inequities with the inclusion of the social determinants of health into the Ontario Public Health Standards, and the importance of early childhood development has been recognized. Importantly, while public health sits within the Ministry of Health, many of the issues that receive public health focus sit under Ministries like education, environment, and children and youth services. This has meant that alPHa’s resources have been stretched to develop relationships with more partners and track provincial activities in more Ministries. These challenges are being addressed by Ontario’s Action Plan for Health Care that includes the priority of keeping people healthy. For the first time, we have a provincial government that is focused both on the health care system AND on keeping people healthy. Everyone in this room knows that this is a primary objective of the work we do in public health – we understand what makes people healthy and what keeps people healthy. But we also know that public health’s role and value needs to be better understood by provincial and municipal governments. This is where we would like to focus the work of alPHa. We want alPHa’s members, the public health units of Ontario, to be recognized as provincial and local leaders in keeping people healthy to attract the resources that are needed for us to have a greater impact on the health of the communities we serve. alPHa’s Board sees that we have a great opportunity to position the association to promote the role and value of public health. We are considering a number of actions to that end that are outlined in the 2-page document that has been distributed. In addition to those action items we are looking at alPHa’s governance structure and asking some difficult questions that we believe need to be asked if alPHa is to best serve its members into the future. We believe the association is doing good work now, but we also recognize that we have limited resources and need to prioritize. So, I invite you to read the 2-page summary we’ve provided and to participate in the consultation process that will be taking place over the summer and fall. It is important for us to hear from alPHa’s members about what is most important to them, as well as how the Association can best serve their needs. Following this presentation, Linda Stewart then introduced and thanked the 2012 - 2013 alPHa Board members, highlighting the contributions of outgoing Vice President Mary Johnson, COMOH Chair Penny Sutcliffe, Boards of Health Section Chair Al Edmonson and President Dr. Paul Roumeliotis. Parliamentarian Dan Lynch was then introduced to oversee the Resolutions session. Six resolutions were considered by the alPHa membership this year, which address tobacco, oral health, breastfeeding, gambling and physical activity. One was referred to the Board of Directors, and the others were passed with some amendments. Please see the Disposition of Resolutions for details on each and visit our Resolutions section to view ongoing actions on the adopted ones in the coming months. alPHa President Dr. Paul Roumeliotis stood to welcome all delegates to alPHa’s 27th Annual Conference, including members, colleagues from partner organizations, special guests and public health and preventive medicine residents from across Ontario who have taken a break from their studies and residencies to join us. He also acknowledged sponsors Merck, Public Health Ontario, the Public Health Division, Pfizer Canada, Vaccines Division, and Mosey & Mosey Insurance for helping to make this conference possible. André Picard is well known to many of us as a journalist who really understands public health. He is the public health reporter at The Globe and Mail and one of Canada’s top public policy writers. He has received much acclaim for his writing, including the Michener Award for Meritorious Public Service Journalism, the Canadian Policy Research Award, and the Atkinson Fellowship for Public Policy Research. In 2005, Andre was named Canada’s first Public Health Hero by the Canadian Public Health Association, and he has received numerous awards and recognition from a long list of organizations. André lives in Montréal and joins us today to moderate our panel, Confronting the Challenges. Brian Cook is a research consultant with the Toronto Food Strategy team at Toronto Public Health. He works with City and community partners to research, coordinate and implement innovative projects to increase access to healthy, affordable and culturally appropriate food. His current projects include a mobile fruit & vegetable vending pilot, healthy corner stores research, mapping Toronto's "food deserts" and research on advertising to children. Brian spoke about how food production, distribution and consumption have changed over time and how the public’s perception of the food system has changed as a result. He expanded on this reality to argue the importance of the development of a National Food Strategy, which would prioritize health and nourishment by addressing fundamental issues such as sustainable farming, growing food that is affordable and improving distribution channels for those who need it. He further argued that while governments need to play an enabling role, they cannot be solely responsible for generating innovative ideas on how to implement such a strategy. He used specific examples that Toronto is using to incubate new ideas such as its Mobile Good Food Market, which increases access to healthy, affordable and culturally appropriate foods. 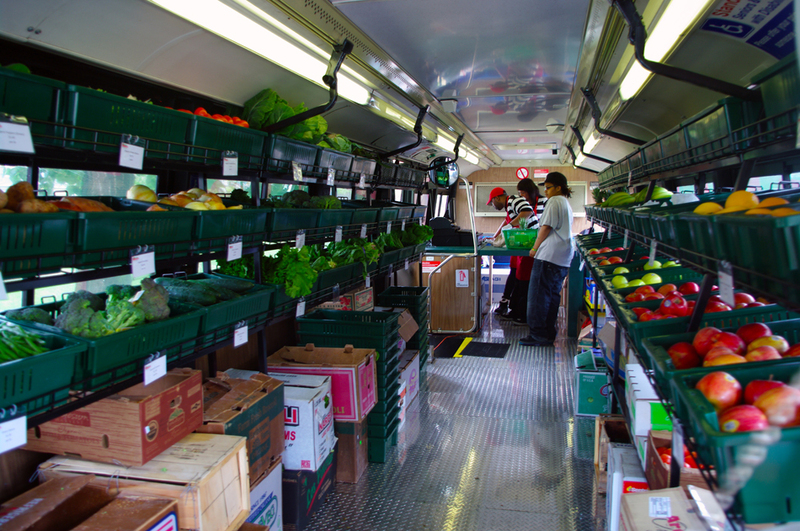 Also referred to Chicago’s Fresh Food Bus as a model for something that will be rolled out in Toronto this summer. Roberta Ferrence is Senior Scientific Advisor for the Ontario Tobacco Research Unit at the University of Toronto, Professor in the Dalla Lana School of Public Health and Affiliate Scientist with the Centre for Addiction and Mental Health. She has training in Epidemiology and Medical Sociology. Her research focuses on tobacco smoke exposure, including the economic and environmental impact of smoke-free bylaws, indoor and outdoor air quality studies including water pipe, and third hand smoke exposure. Roberta opened her talk with a summary of legislative and research milestones in tobacco control to illustrate the significant progress that has been made on what is known about the dangers of tobacco and what has been done to control it as a result. She then pointed out that there remain equally significant challenges, including low taxation in Ontario, wide availability, new products, third-hand smoke, and most significantly, the perception that the war on tobacco has already been won. Smoking remains relatively widespread, but identifiable groups remain at particular risk, such as low income, First Nations, and residents of multi-unit dwellings. She indicated that Canada is beginning to fall behind on stemming smoking rates and suggested that public health needs to start thinking about different messaging, changing areas of focus and making better use of dwindling tobacco control resources. She made some preliminary suggestions for policy levers to address them. Robert Mann is a Senior Scientist in the Social and Epidemiological Research Department at the Centre for Addiction and Mental Health. He is also Associate Professor in the Dalla Lana School of Public Health at the University of Toronto, where he is the Addiction and Mental Health Field Director for the MScCH program. Alcohol epidemiology and alcohol policy issues have been major interests of his research. Robert gave a brief presentation on new directions in alcohol, in light of an emerging body of evidence that supports a shifting of attitude towards alcohol as a very powerful substance that is prone to abuse, associated with negative health and social outcomes. He argued that attention needs to be squarely focused on reduction of overall consumption in general and high-risk drinking in particular. He referred to Norman Giesbrecht’s report on the ten dimensions of alcohol policy as a reference for control measures that are demonstrated to be successful. He noted that Ontario is doing reasonably well on average, but the average itself needs work. He referred to the fact that measures that have already been taken have saved billions of public dollars over the past 35 years. He then suggested some particular areas of focus (public control over alcohol retailing, pricing, availability and public education) that should form the core of a Provincial Alcohol Strategy. The moderator challenged each of the speakers to name what they think might be the most important step that can be taken locally in addressing the respective challenges. Brian Cook raised the idea of a Food Charter- something that is non-binding but brings the perspectives of many people together – as the type of thing that underlies real success. Roberta Ferrence strongly urged scanning our own communities to look at what is being promoted. Robert Mann suggested Municipal Alcohol Policies and to encourage MOHs to express support for a provincial alcohol strategy. The moderator then asked about the impact of low socio-economic status and health inequities. Roberta pointed out that low income populations are higher consumers of tobacco, but not by much. They are however more exposed and lack the political power to do anything about it (e.g in low-income multi-unit dwellings). She mentioned children as an example of a population that is at similar risk because of the choices of their parents. Brian echoed this, indicating that it is difficult for marginalized populations to find a voice, which in turn affects policy attitudes towards food availability. The common response now is food banks, when the actual solution needs to be income-based. Mr. Picard then asked what is required to change public attitudes about the various issues. Robert referred to the promotion of the Low-Risk Drinking Guidelines while embracing the "moderationists”. He also pointed to some areas where we have been extremely successful (e.g. drinking and driving) that have been the result of a variety of social marketing strategies and legislative change. Not through preaching, but by provision of information. We can use those strategies to address things like binge drinking as well. Roberta felt similarly where tobacco is concerned, urging ongoing promotion of the real dangers of tobacco while at the same time addressing the lingering rights and freedoms issues. Brian recommended taking advantage of the current political and media focus on the obesity epidemic as a launching pad for a broader discussion about how food is produced, distributed and consumed affects health. Where children are concerned, Brian further argued that we need to start focusing on raising a new generation that is more aware of the food system and how it works, which will empower them to make healthy decisions and recognize food marketing for what it is. It needs to start in the schools, so that whole households will have the required knowledge. When Mr. Picard asked if this might be too much to ask of schools, Brian responded that since the food marketers desperately want access to schools as well, it is imperative to ensure that we are in there. Roberta then suggested that with tobacco, we may actually need to stop focusing on kids. Adults are the ones in charge, and kids model their behaviour on them, and until they grow up never seeing a smoker, they’re going to see it as normal behaviour. The discussion was then open to the floor, so that delegates could ask questions and make their own observations about what we’re up against and how to overcome the challenges. The glossy LCBO promotional materials were raised as an example of Government spending money to promote products that are known to be unhealthy in many circumstances. Robert agreed, but argued that as long as the Province has sole control over this business, we have a single target for direct advocacy on social responsibility. Andre Picard then turned to Brian to ask about the potential for marketing to promote healthier foods. His response was that healthy foods are in a different category. While he acknowledged that it may not be enough to tell people to eat healthy, he also conceded that promoting broccoli in a glossy magazine is never going to work as well as changing attitudes about the food system. Roberta Ferrence responded to a question about why it is that certain demographics are still smoking by suggesting that the answer is usually found in opportunity and normalization. In other words, it doesn’t matter who’s smoking so much as the opportunities to smoke that keep it so visible. She cited the unintended consequence of indoor smoking bans as an example: with so many people smoking outside, it is now far more visible than it was. We therefore need to keep working at a whole-population level. One member referred to marginalized segments of the population that may look to unhealthy behaviours such as drinking and smoking to engender a sense of belonging and importance that they don’t otherwise have, adn asked how we get them to take up the health promotion messages when they feel that they don’t matter. Robert Mann agreed that this is a valid question on a complex issue, and one that needs to be kept in mind when developing strategies. Brian observed that this question is also related to the stresses of low-income, and it doesn’t help that the exhaustion of the poor is mistaken by those who don’t know any better for laziness. It is the stigma and stress that need to be tackled. A final question was asked about how we can compete with industry, whose marketing and messaging capacities are well ahead of public health’s. Brian’s response was that we shouldn’t think of industry as the competition. While it is true that they have the upper hand in marketing, they aren’t using it for the purposes of good or evil; they are using it to generate wealth. It’s therefore Government’s role to put limitations on what they are allowed to do to that end, and we should never depend on corporations to act in anyone’s best interests other than their own. Mr. Picard summed up the session by pointing out that there has been lots of success on all of these fronts, but challenges remain. He then offered a parting suggestion that gambling might be the subject of a similar discussion in the near future. Dr. Roumeliotis welcomed Ministers Matthews and Piruzza to the meeting, who are the co-chairs of the newly-struck Ministers Working Group on Healthy Kids, which is charged with examining the recommendations of the Healthy Kids Panel with a view to meeting the Government’s stated goal of reducing childhood obesity by 20% over five years. Minister Matthews started out by stating that the Working Group is absolutely committed to the three pillars of the Healthy Kids Panel strategy, noting the strong evidence that this is a huge health issue. 28% of kids are overweight or obese and at risk of a host of chronic diseases later in life, and we need to do something about that. She also observed that when the Panel was launched, it was to include a very wide range of perspectives, but as work progressed, it became clear that this issue is far more about food than it is about physical activity, and the change in eating habits in kids over the last 30 years is at the root of the problem. Minister Piruzza added that good health starts with birth and referred specifically to the important role of the Healthy Babies, Healthy Children program in laying the foundation to the life-course perspective of the Healthy Kids Strategy, where early identification and intervention yield the best outcomes. She referred to the recent steps to improve the program to ensure greater effectiveness and announced that the new HBHC protocol will be introduced later this year. She also mentioned the Ontario Student Nutrition Program, which provides nutritious snacks and lunches for over 690 000 students, and to the Mental Health and Addictions strategy, which is improving access to services such as mental health school workers for 50000 kids and their families. Both of these programs benefit from a range of local partnerships. Minister Matthews then observed all of this is a constellation of programs and services that are aimed at keeping kids healthy and at making Ontario the healthiest place in Canada to grow up and grow old. She added that the Government is constantly working on the wellness aspect of health, mentioning action on smoking rates (NRT, cessation programs in hospitals and workplaces), legislation to ban tanning, and the implementation of Health Links, which she hopes will bring public health perspectives more to the forefront in discussions about Ontario’s health care system. Both Ministers expressed profound appreciation for the things that alPHa’s members do to support all of these goals. They also indicated that they are mindful of the challenges that local public health can face, and they will do their best to ensure that action on the HKP recommendations reflect local needs. Minister Matthews reiterated that striking the right balance between healthy eating and healthy communities will be important, and to that end, the following Ministries are on the Working Group: Education, Agriculture and Food, Tourism Culture and Sport, Aboriginal Affairs and Municipal Affairs and Housing. She added that the more they talk, the more they realize others will need to be brought in. They are taking this very seriously and the Premier is a strong supporter. She then indicated that this work will need to be informed by the local perspective, and there will be opportunities to ensure that alPHa’s members can contribute. Responding to a question about changing the ratio of MOHLTC dollars spent on care vs. prevention, Minister Matthews indicated that additional funding for vaccinations and nicotine replacement therapies has already changed it a bit, but reiterated that money is the primary issue right now (there isn’t any) and it is therefore now time to come up with creative ways to get the better health outcomes that we want with existing resources. There were also questions about prioritizing the HKP recommendations based on the likelihood and timing of their implementation at the policy level. Specific inquiries were made about regulating food content, banning marketing to children, establishing a surveillance program (on which COMOH has already made a proposal), how the Poverty Reduction Strategy will be linked and how opportunities for input will be communicated. Minister Matthews responded that prioritizing will depend in large part on what the Working Group hears from us, indicating that local public health has led the way on many issues that eventually became government policy. She urged public health to tell her what is important by continuing to highlight the problems that provincial policies can and should be implemented to address. She also noted that some of the recommendations are contentious, and the more support she hears from public health, the less rocky the path will be to finding solutions. This is particularly important in a minority government situation, where it is especially difficult enact legislation. She added that all levels of Government have to be involved, as there are different jurisdictions where regulation is concerned. We can however do more on the information front, citing the strong support that there appears to be for mandatory menu labelling in restaurants as an example. She also mentioned the recently-introduced Local Food Act (Bill 36) as a policy initiative that will support actions for a healthier population. She also urged alPHa’s members not to wait for them if it is clear that useful local action can be taken now. Members expressed a clear desired to participate in the collective action on the HKP recommendations, and asked that timelines and opportunities to provide input to the Working Group need to be clearly communicated. It was also noted that this is the type of inter-ministerial committee that should be in place for a range of health issues, to reflect the whole-of-government approach to health that the CMOH proposed in her recent annual reports. Keynote Speaker: Michael Moss, Pulitzer Prize-winning Journalist and Author of Salt Sugar Fat: How the Food Giants Hooked Us. Before coming to The New York Times, Michael was a reporter for The Wall Street Journal, New York Newsday, and The Atlanta Journal-Constitution. He has been an adjunct professor at the Columbia School of Journalism, and is the recipient of a Loeb Award and an Overseas Press Club citation. He won the 2010 Pulitzer Prize in Explanatory Reporting for relentless reporting on contaminated hamburger and other food safety issues that, in print and online, spotlighted defects in federal regulation in the United States and led to improved practices. Featuring follow up Discussion with Dr. Paul Roumeliotis, alPHa President; Dr. Vivek Goel, President and CEO, Public Health Ontario; Dr. Robin Williams, Associate Chief Medical Officer of Health, Ministry of Health & Long-Term Care; Kate Manson-Smith, Assistant Deputy Minister, Health Promotion Division, MOHLTC; and Heather Thomas, Co-Chair, Ontario Society of Nutrition Professionals in Public Health. Dr. Roumeliotis kicked off the afternoon session by inviting Keynote Speaker Michael Moss to give members an inside look at the investigations that led to the writing of his new book , "Salt Sugar Fat: How the Food Giants Hooked Us”, following which he would join some special guests for a panel discussion. Michael introduced himself as an investigative journalist before anything else, and related a tale about how he was on assignment to cover militancy in Algeria and, having discovered that his name was on a list that clearly indicated that he was in harm’s way, followed his editor’s advice to find something less perilous to report on. The next issue that fell onto his desk was essentially a story about how the food industry had "lost control of its ingredients”, beginning with a few items about contaminated food, including a story about a young woman whose life was changed by eating an E. coli-contaminated hamburger. This story provided him with an emotional hook that led him to delve deeper into how foods are formulated and to the revelation that reasonable steps are intentionally not being taken by industry to protect the public. During these inquiries, he spoke with microbiologist Dr. Mansour Samadpour, who, while giving him information on the pathogenesis of E. Coli, suggested that as tragic as contaminated food can be, a whole other dimension of the food industry is as important to health, namely the engineering of foods to maximize appeal and profit. This led him to continue down the rabbit hole, finding new surprises at every turn. He rimed off alarming statistics about the relationship between diet and illnesses such as diabetes, gout, heart disease and all sorts of other maladies for which obesity is a risk factor. What surprised him most was that the food industry knew all about the links between the way they "engineered” their foods and these negative health impacts. He clarified that he does not see the food industry as evil. The health impacts of eating their products is no more than a side-effect of industry doing what it’s supposed to, namely to increase the appeal of what it’s selling, keeping the price low, and ensuring wide distribution to generate maximum profit. Moreover, not only does the food industry strive to make consumers like their products; it has learned the value of striving to get us to need more of them. He revealed that he was permitted to look at lots of internal documents during his research, and it occurred to him – based on what he knew about the tobacco industry - that what is being peddled by the industry is in essence addiction, even if it doesn’t meet the classical definition as it applies to narcotics or tobacco. Working in their favour is that you can’t quit food, and they can invent euphemisms such as "craveability”, "snackability” and "moreishness” that mirror addiction but are somewhat more palatable. He then referred to Howard Moskowitz, an experimental psychologist who was once engaged by the U.S. Military to get soldiers to eat. He used a strategy called "food optimization”, something that he applied to great effect later on in the food industry. His initial job was to find the "bliss point” for food, that is the combination and amount of ingredients in the formulation that would make it most palatable. Engineering "bliss points” is now just as common for bread, low fat yogurt, pasta sauce, salad dressing and all sorts of other things as it once was in soda. This, Mr. Moss concluded, is screwing with the biology of children, as it conditions them to expect a baseline of sweetness in pretty much everything. He then told of how Jeffrey Dunn, former chief operating officer of Coca-Cola North America walked him through all of the things that Coke has done over the years to ensure maximum distribution of its product, whose appeal is well known. He indicated that among its most successful strategies was " up-and-down-the-street marketing”, whereby the decision to service corner stores as the primary outlet for Coke would foster brand loyalty among kids (a significant clientele) and ensure that big Coke-branded trucks were constantly visible in any neighborhood. He then shared that Mr. Dunn was among those industry insiders who experienced some regret about all of this, and attempted to repay his karmic debt by taking the "snackability” factor to the produce aisle in the form of the now-ubiquitous bags of baby carrots. At the end of the day, Mr. Moss was surprised not only by how little regulatory control there is over the food industry, but also by the government’s complicity. To illustrate this, he played a short video that outlined how the increasing prevalence of cheese in the American diet came about. His conclusion was that we cannot count on government to act in our best interests. Returning to the tobacco analogy (one about which the food industry is particularly nervous), he reminded that tobacco giant Philip Morris has become a food giant (owning both General Foods and Kraft), and it applies all of its clever tobacco marketing and promotional strategies to its food concerns. In addition to that, it already had the experience of losing the public trust as more and more evidence came forward about the dangers of tobacco. In a clever move to regain that trust, the tobacco industry voluntarily submitted to regulation. This strategy is the subject of the now well-known preamble to Mr. Moss’s book, where a food industry executive drew a parallel between the food and tobacco industries for the first time in the 1990s. He observed that Industry cannot be expected to change any of this for reasons of ethics alone. Even if their intentions are good, the ultimate purpose of industry is profit, and until healthy products and social responsibility are a profitable mainline business, limits will need to be imposed. He did note that there is lots of research being done by the food industry on formulating, marketing and distributing healthier products, but it has not yielded enough practical or profitable ideas. He referred to Nestle in particular as having a robust research department of over 700 genius scientists that has not yet figured out how to make something more appealing and profitable than a Hot Pocket. He drew attention to our own culpability as consumers in a culture of convenience and mindless eating. On a positive note, he suggested that we may be at a tipping point, as people are very concerned about what they eat, and they have access to information to help them control it. He added that the annual medical and productivity costs of the obesity crisis alone should fuel the political appetite for government intervention, without which the playing field is not level and it is not a fair fight. He then pointed out that the profit motive vs. public good is still a compelling conflict to young people, even if nutrition isn’t their first concern: they don’t like being deceived. Panel members were then invited to the stage to have a discussion about their reactions to the talk and to explore some positive steps that can be taken as we learn more about what public health is up against where the food industry is concerned. Dr. Vivek Goel started the discussion stating that this is a fight that needs to be taken to private spaces and corporate board-rooms alike. He echoed the idea that corporations are not evil and that shareholders are not a homogeneous bunch, and then noted that there are some differences in corporate law in Canada that may proffer some advantage in this regard. The long-term interests of corporations and their shareholders need to be utilized – after all, corporations still need customers, and "activist shareholders” can drive interests in the boardroom that are aimed at the corporation’s long-term sustainability as opposed to focusing on short-term profit. Food safety and health should be an easy target for this. He added that procurement policies for institutions (and even grocers) can be an excellent tool for increasing the distribution of healthy foods, and that the provision of more information to consumers will help them navigate the numerous dubious health claims that appear on food products. He observed that public attitudes are already shifting as awareness grows. Dr. Robin Williams drew on her experiences as a pediatrician to illustrate that she worked under certain assumptions when it came to childhood nutrition and healthy weights while being completely unaware of some of the practices that are outlined in this book. With that awareness, she strongly agreed that government intervention is going to be essential to fixing the problem of unhealthy eating, which she characterized not so much a public health problem as a societal one. As such, it is going to take some time to translate all of this information into a successful strategy. Ka te Manson-Smith shared that despite considering herself a reasonably savvy consumer; she was also largely unaware of the deception that lurked on every store shelf. She also appreciated the historical accounts in the book, and wondered aloud about how the need for convenience can be reconciled with the health imperative. She then expressed hope that this knowledge can be part of the backdrop for strategizing on the Healthy Kids Panel recommendations. She repeated the Minister’s advice to start acting locally to not simply educate, but to engage and influence consumers. She also agreed that if food industry products are part of the problem, the manufacturers need to be part of the conversation that is aimed at solving it. Mr. Moss closed by agreeing that awareness is growing and attitudes are shifting, and this is having an influence on the business practices of the manufacturers. They know that the public is much more able to identify a "PR rap” when they see it and that it doesn’t react well to being deceived. He illustrated this by pointing out that Kraft has voluntarily decided to provide clearer and more honest information on its own Nutrition Facts labels; and that the industry as a whole is irritated with the soft drink companies, as this is where the analogies with the disingenuous marketing practices of the tobacco industry seem most fitting. Steve Foran is an electrical engineer who completed an MBA and discovered he cared about a lot more than the bottom line. With 35 years’ experience in the service industry, he has served demanding CEOs and little old ladies – and today he is known as the Gratitude Guy. Steve specializes in helping individuals and organizations master service excellence and find greater happiness. When he’s not doing that, he’s teaching Business Ethics at Saint Mary’s University in Nova Scotia. Steve has shared his simple yet innovative approach with close to 50,000 people throughout Canada and the United States. His keynote session will offer us a unique perspective on developing leadership capacity using appreciation and gratitude to help us lead healthier lives and, in turn, better help others to live healthier lives. "HEY! I told you last month– those ones out back are for my son” yelled the man on the ladder upon hearing a clatter of glass below him in the backyard. With this story, Steve suggested that pre-conceived notions are difficult to let go of and can be important barriers to happiness, because it gives too much weight to the idea that it is always the other person that needs to change – something over which we have far less control. He further suggested that being more than mediocre requires us to serve others as an expression of the gratitude that we should all feel for receiving all of the help that we do. In short, he serves because he’s grateful. He elaborated by asking the rhetorical question, "why did I get all of this”? The temptation can be to be self-congratulatory and claim to be a self-made man, but the reality is very different. Everything that we are and everything that we are able to do depend strongly on where and when we start out, and that is simply a stroke of luck. Why, he asked, was he born in a prosperous country such as Canada, in a good home where food was always available and friends were always welcome? How was it that his family, one of relatively limited means, still lived more comfortably than even Royalty did not much more than a century ago? Why is it that he was handed all of the things that made it possible for him to have the life he has and to do pretty much anything he chooses to do? Instead of searching too hard for the answer, he has simply translated the immense gratitude he feels for having received these gifts into a need to serve others. He likened his life to a lake that depends on influx and outflow to stay alive. He continued with a description of his life as a young man who had just moved to Oshawa from the East Coast, and following a string of bad luck, found himself homeless, jobless and in possession of nothing more than a pocket full of ketchup. Feeling hopeless, a friend reminded him that these were just setbacks, and that the list of things he still had was far longer than the one of things he had lost. Focusing on what he has became the fuel for the gratitude that still moves his need to serve. He left the audience with a series of questions and an assignment. How intentional are we going to be in our quest to be more caring, more happy, and more grateful? How are we going to use that to serve our communities by keeping them healthy? Are we going to keep an open mind in so doing, or are we going to hang on to our preconceptions about people and life? Are we going to remember that everything we do is going to make a difference? For the assignment, he handed out copies of his own bestseller - a blank notebook into which he asked members to write three things that they are grateful for each day. Part 2 of the assignment is to talk about one of those things to someone else. With this, he hoped that members would use gratitude as the fuel to move their own need to serve, to confront challenges, to recognize opportunity and to be able to help people understand that they understand both sides of each story. As every year, alPHa uses its annual conference as an opportunity to recognize individuals for outstanding contributions made to public health in Ontario in the form of the Distinguished Service Award (DSA). This year, alPHa was honoured to present DSAs to Joan Carrothers (Ontario Association of Public Health Dentistry), Vivek Goel (Public Health Ontario), Meighan Finlay (Ontario Council on Community Health Accreditation) and Penny Sutcliffe (Sudbury and District Health Unit). Biographies of this year’s recipients and a complete list of past honourees can be viewed by clicking the programme at left. Full-sized photos are linked to the thumbnails below. Roselle Martino referred to the slide deck linked below while providing an update on the Public Health Sector Strategic Plan, Make No Little Plans. She provided a recap of the plan, and drew particular attention to the fourth slide, observing that while the health sector partners on the diagram are obvious and clear, the partnerships with non-health sector partners is less so. Public health is the overlap between the two, and she indicated that there is a growing understanding that public health’s overlap with the non-health sector may nevertheless be more important. She then summarized some proposed actions and reported that there is increasing support for the plan (including the notable fact that other Ministries are actively looking for opportunities to be engaged in the process where appropriate). The plan is meant to be an anchor for discussions going forward rather than another itemization of what public health already does. It is meant to support the pillar of "keeping people healthy” in Ontario’s Action Plan for Health Care. Sustaining the momentum now that the plan has been launched will be achieved in part by harnessing local expertise, increasing collaboration within the sector and raising the profile and understanding of what public health is and does with the public and the policymakers. This last objective will be served by working with internal and external partners, developing a communications plan and examining options for branding. Finally, she described the "tables” that will be established to examine t early childhood development, the built environment, public health human resources, sector infrastructure, and the prevention of communicable and infectious diseases. A detailed implementation plan is expected by the end of the year. Public Health Ontario President and CEO Vivek Goel then rose to give a summary of his organization’s strategic plan, which is being rebooted as PHO enters its sixth year on the Ontario public health scene. He noted that it has now been ten years since the SARS outbreak, an event that led to PHO’s creation. With that, he gave an overview of the purpose of PHO in its supporting roles for local public health, the Ministry, the broader health sector and beyond. He also noted the short time that has elapsed since the creation of PHO with a staff of one (him) to the thousands-strong organization that it is today. He then moved on to a description of the inputs to PHO’s strategic planning activities, namely the surveys, consultations and interviews that are being reviewed and considered against the purpose and legislated objects of the agency. The broad goal will be to facilitate continuous external engagement and to ensure that PHO’s suite of services (i.e. the information and tools that are required to take action on issues related to public health) is well known and readily available to those who are meant to benefit from them. The Plan is expected to be launched next year. Roselle Martino and Sylvia Shedden then returned to give an update on Key Initiatives of the Public Health Division, namely planning for the 2013/2014 Universal Influenza Immunization Program, administrative improvements to Healthy Smiles Ontario, further exploration of Public Health’s role in Health Links, operationalizing of the Performance Management Framework, Protocol Evergreening, future considerations for Accreditation and funding updates. The linked slide deck contains all of the necessary details and speakers’ notes. Roselle also reiterated that one of the Public Health Division’s functions is to "make the case” for Public Health within the broader Government budgeting machinery. She wanted to convey that they do a lot of work internally to get what they can and lots of thought and rigour goes into that process, looking at the trade offs, focusing on areas that really do need increments and areas that may survive resource shifts. All will be revealed by the end of June. Responding to a question about capital funding, Roselle indicated that there is a "community capital” line in the broader budget, and the PHD is exploring how that line’s definition might be expanded to cover the needs of local public health. A caution was also raised from the floor about the pressing need to rationalize Ontario’s publicly-funded oral health programs rather than add yet another administrative layer (as proposed in the slide deck). Roselle agreed, but responded that rationalization is going to be a complex process and the measures being taken now are temporary ones. Concerns were also expressed about the energy being spent on public health’s relationship with Health Links, which is a program aimed at addressing the needs of the heaviest users of the health care system and as such outside of the mandate of public health. Roselle indicated that she understood and respected that view, but that the Ministry is still interested in taking this opportunity to fully and fairly answer the question of what role, if any, public health might play. She also clarified that this question is intended to be answered through an understanding of what public health itself thinks its role should be and not through having one imposed on it. Another concern was raised about the UIIP reimbursement inequity (i.e. that pharmacists are being paid 50% more per dose administered than other providers) may lead community practitioners to cease offering flu shots. Roselle answered that this is being looked at as part of the Immunization System Review, which is expected to be completed by September. She also assured alPHa’s members that the significantly higher rate paid to pharmacists did not go unchallenged. Meeting Materials will be distributed to members under separate cover. They will also be made available in the Members’ Groups pages on alPHaWeb (log-in required). Resolutions voted on by the alPHa Membership at the 2013 Annual Business Meeting. 4. Extend provincial programs to include adults who need and cannot afford emergency dental care. THAT the Association of Local Public Health Agencies call for the Province of Ontario to refrain from expanding gambling availability as a way to generate additional revenues in Ontario; AND FURTHER that the Association of Local Public Health Agencies partner with health units and other stakeholders to strengthen and develop strategies that prevent or mitigate gambling-related harm in Ontario, promote awareness of treatment options, and protect vulnerable populations. THAT the Association of Local Public Health Agencies (alPHa) advocate for provincial legislation to be enacted to prohibit the use of waterpipes (regardless of the substance being smoked) in all enclosed public places and enclosed workplaces. THAT alPHa urge the Government of Ontario to endorse the “Taking Action to Prevent Chronic Disease” report from Cancer Care Ontario and Public Health Ontario, and take immediate action towards implementation of the recommendation to require students to earn a physical education credit in every grade from 9 to 12 to achieve high school graduation; AND FURTHER that a collaborative approach be taken to development of the curriculum that includes the Ministry of Education, Ministry of Health and Long Term Care, Boards of Education, Secondary School staff, parents and students to ensure a positive experience for Ontario’s youth that will encourage healthy active living into adulthood. Collection of slide decks that have been provided by presenters that may be of interest to alPHa members. These will be primarily from alPHa symposia and conferences, but some may be included from partner events if we believe that the content will be sufficiently interesting to our members. Please note that this collection includes only materials that we have been granted permission to share. If you are looking for materials from meetings of alPHa's Sections, Board of Directors or ad hoc committees that do not appear here, please go to the associated members or group pages, where additional meeting-specific materials may be accessible to members of those groups. June 4 2013 alPHa Conference presentation by the Public Health Division on current priorities and initiatives. June 4 2013 alPHa Conference presentation by Vivek Goel on Public Health Ontario's five-year strategic plan. June 4 2013 alPHa Conference presentation by Roselle Martino on ongoing activities related to the Public Health Sector Strategic Plan since its release in April 2013. June 3 2013 alPHa Conference presentation by Robert Mann on new directions in alcohol policy that are based on a growing body of evidence about the negative health impacts of its consumption. June 3 2013 alPHa Conference presentation by Roberta Ferrence on successes and outstanding challenges in tobacco control in Ontario. June 3 2013 - alPHa Conference Presentation by Dr. Brian Cook on how food production, distribution and consumption have changed over time and how the public’s perception of the food system has changed as a result. November 7 2012 presentation to the alPHa Fall Symposium by Jacky Sweetnam (Strategic Policy and Planning Branch) and Justine Hartley (Emergency Management Branch). November 7 2012 presentation to the alPHa Winter Symposium by Laura Belfie, Manager, Public Health Units and Standards; Kelci Gershon, Manager, Policy Development and Liaison; Daina Mueller, Manager, Tobacco and Chronic Disease Prevention; Jackie Wood, Manager, Initiatives; Anita Hooper, Manager, Project Office of the Health Promotion Division. Text of remarks to the 2009 alPHa Fall Symposium - Equity from the Start. Presentation to the alPHa Fall Symposium, October 22 2009. Summary of presenations and discussions that were part of alPHa's 2009 Winter meeting, on the subjects of sustainable food and marketing to children. Includes links to presentation slide decks.